These definitions and interpretations represent a variety of objectives and strategies for managing pests. IPM is not a principle that can/should be strictly and equally applied to every situation, but a philosophy that can guide the practitioner to use it as appropriate for the situation. For example, varieties that are resistant to arthropod pests and diseases are available for some crops, but not for others. Mating disruption with pheromones is widely practiced for certain lepidopteran and coleopteran pests, but not for several hemipteran pests. Biological control is more readily employed for greenhouse pests, but not to the same extent under field conditions. While chemical pesticides should be used as the last resort, in principle, sometimes they are the first line of defense to prevent damage to the transplants by certain pests or area-wide spread of certain endemic or invasive pests and diseases. Crop production is an art, science, and business, and by adding environmental and social factors, IPM – an approach used in agriculture – can also be influenced by a number of factors. Each grower has their own strategy for producing crops, minimizing losses, and making a profit in a manner that is acceptable to the society, safe for the consumers, and less disruptive to the environment. In other words, “IPM is an approach to manage pests in an economically viable, socially acceptable, and environmentally safe manner”. Keeping this simple, but loaded, definition in mind and considering recent advances in crop production and protection, communication technology, and globalization of agriculture and commerce, here is the new paradigm of IPM with its management, business, and sustainability aspects. 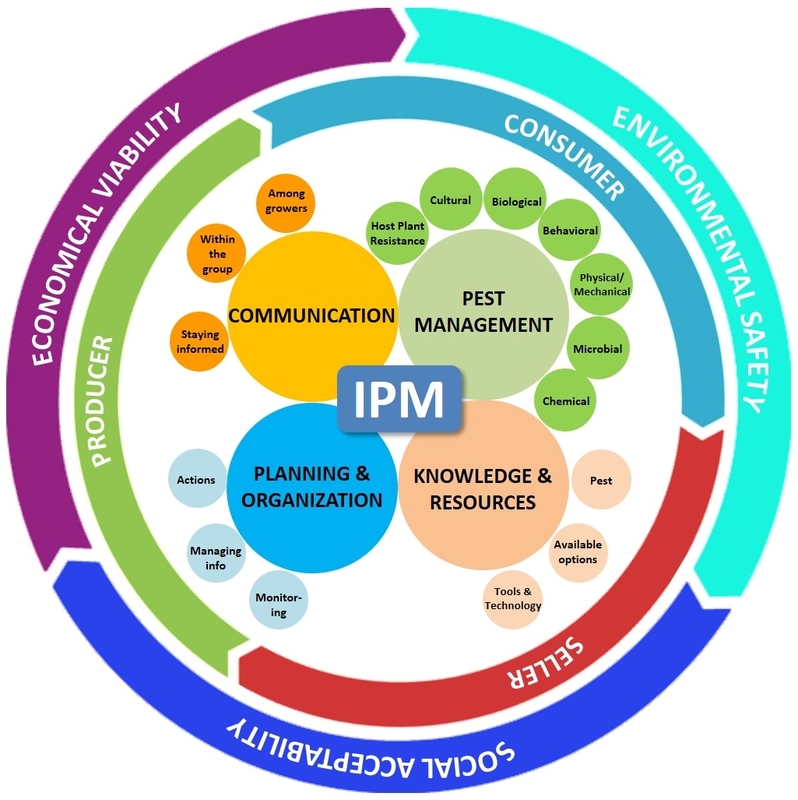 There are four major components in the IPM model that address the various pest management options, the knowledge and resources the grower has in order to address the pest issue, planning and organization of information to take appropriate actions, and maintaining good communication to acquire and disseminate knowledge about pests and their management. The concept of pest control has changed to pest management over the years knowing that a balanced approach to managing pest populations to levels that do not cause economic losses is better than eliminating for environmental and economic reasons. Although the term control is frequently used in literature and conversations, it generally refers to management. A thorough knowledge of general IPM principles and various management options for all possible pest problems is important as some are preventive and others are curative. It is also essential to understand inherent and potential interactions among these management options to achieve maximum control. The following are common control options that can be employed at different stages of crop production to prevent, reduce, or treat pest infestations. Each of them may provide only a certain level of control, but their additive effect can be significant in preventing yield losses. a. Host plant resistance: It involves the use of pest resistant and tolerant cultivars developed through traditional breeding or genetic engineering. These cultivars possess physical, morphological, or biochemical characters that reduce the plant's attractiveness or suitability for the pest to feed, develop, or reproduce successfully. These cultivars resist or tolerate pest damage and thus reduce the yield losses. b. Cultural control: Changing agronomic practices to avoid or reduce pest infestations and damage refers to cultural control. Adjusting planting dates can help escape pest occurrence or avoid most vulnerable stages. Modifying irrigation practices, fertilizer program, plant or row spacing, and other agronomic practices can create conditions that are less suitable for the pest. Destroying crop residue and thorough cultivation will eliminate breeding sites and control soil-inhabiting stages of the pest. Crop rotation with non-host or tolerant crops will break the pest cycles and reduce their buildup year after year. Choosing clean seed and plant material will avoid the chances of introducing pests right from the beginning of the crop production. Sanitation practices to remove infected/infested plant material, regular cleaning field equipment, avoiding accidental contamination of healthy fields through human activity are also important to prevent the pest spread. Intercropping of non-host plants or those that deter pests or using trap crops to divert pests away from the main crop are some of the other cultural control strategies. c. Biological control: Natural enemies such as spiders, predators, and parasitic wasps can be very effective in causing significant reductions in pest populations in certain circumstances. Periodical releases of commercially available natural enemies or conserving natural enemy populations by providing refuges or avoiding practices that harm them are some of the common practices to control endemic pests. 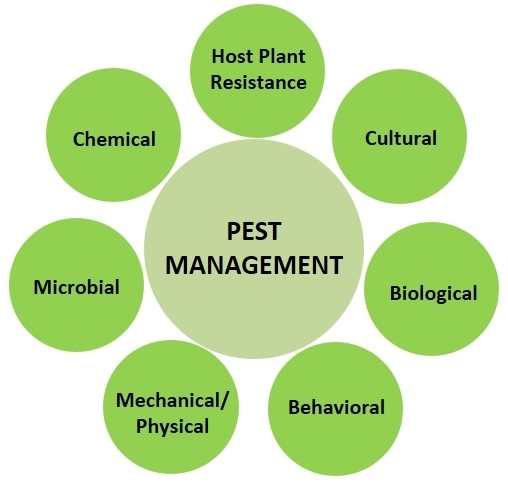 To address invasive pest issues, classical biological control approach is typically employed where natural enemies from the native region of the invasive pest are imported, multiplied, and released in the new habitat of the pest. The release of irradiated, sterile insects is another biological control technique that is successfully used against a number of pests. d. Behavioral control: Behavior of the pest can be exploited for its control through baits, traps, and mating disruption techniques. Baits containing poisonous material will attract and kill the pests when distributed in the field or placed in traps. Pests are attracted to certain colors, lights, odors of attractants or pheromones. Devices that use one or more of these can be used to attract, trap or kill pests. Pheromone lures confuse adult insects and disrupt their mating potential, and thus reduce their offspring. e. Physical or mechanical control: This approach refers to the use of a variety of physical or mechanical techniques for pest exclusion, trapping (in some cases similar to the behavioral control), removal, or destruction. Pest exclusion with netting, handpicking or vacuuming to remove pests, mechanical tools for weed control, traps for rodent pests, modifying environmental conditions such as heat or humidity in greenhouses, steam sterilization or solarization, visual or physical bird deterrents such as reflective material or sonic devices are some examples for physical or mechanical control. f. Microbial control: Using entomopathogenic bacteria, fungi, microsporidia, nematodes, and viruses, and fermentation byproducts of microbes against arthropod pests, fungi against plant parasitic nematodes, and bacterial and fungal antagonizers of plant pathogens generally come under microbial control. g. Chemical control: Chemical control typically refers to the use of synthetic chemical pesticides, but to be technically accurate, it should include synthetic chemicals as well as chemicals of microbial or botanical origin. Although botanical extracts such as azadirachtin and pyrethrins, and microbe-derived toxic metabolites such as avermectin and spinosad are regarded as biologicals, they are still chemical molecules, similar to synthetic chemicals, and possess many of the human and environmental safety risks as chemical pesticides. Chemical pesticides are categorized into different groups based on their mode of action and rotating chemicals from different groups is recommended to reduce the risk of resistance development. Government regulations restrict the time and amount of certain chemical pesticides and help mitigate the associated risks. The new RNAi (ribonucleic acid interference) technology where double-stranded RNA is applied to silence specific genes in the target insect is considered as a biopesticide application. Certain biostimulants based on minerals, microbes, plant extracts, seaweed or algae impart induced systemic resistance to pests and diseases, but are applied as amendments without any claims for pest or disease control. These new products or technologies can fall into one or more abovementioned categories. As required by the crop and pest situation, one or more of these control options can be used throughout the production period for effective pest management. When used effectively, non-chemical control options delay, reduce, or eliminate the use of chemical pesticides. The knowledge of various control options, pest biology and damage potential, and suitability of available resources enables the grower to make a decision appropriate for their situation. a. Pest: Identification of the pest, understanding its biology and seasonal population trends, damaging life stages and their habitats, nature of damage and its economic significance, vulnerability of each life for one or more control options, host preference and alternate hosts, and all the related information is critical for identifying an effective control strategy. b. Available control options: Since not all control options can be used against every pest, the grower has to choose the ones that are ideal for the situation. For example, systemic insecticides are more effective against pests that mine or bore into the plant tissue. Pests that follow a particular seasonal pattern can be controlled by adjusting planting dates. Commercially available natural enemies can be released against some, while mating disruption works well against others. Entomopathogenic nematodes can be used against certain soil pests, bacteria and viruses against pests with chewing mouthparts such as lepidoptera and coleopteran, and fungi against sucking pests. 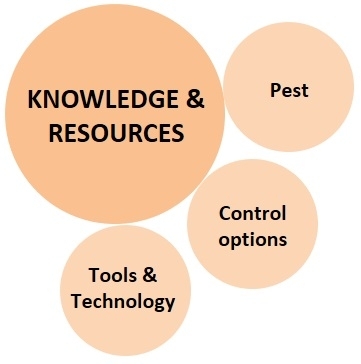 c. Tools and technology: A particular pest can be controlled by certain options, but they may not all be available in a particular place, for a particular crop, or within the available financial means. For example, the release of natural enemies may be possible in high-value speciality crops, but not in large acreage field crops. A particular pesticide might be registered against a pest on some crops, but not on all. Use of netting or tractor-mounted vacuums can be effective, but very expensive limiting their availability to those who can afford. This is a critical component where diagnostic and preventive or curative decisions are made based on available and affordable control options. This component deals with the management aspect of the of the new IPM model for data collection, organization, and actual actions against pest infestations. a. Pest monitoring: Regularly monitoring the fields for pest infestation and spread is a basic step in crop protection. Early detection in many cases can help address the pest situation by low-cost spot treatment or removal of pests or infected/infested plant material. When pest infestations continue to grow, regular monitoring is necessary to assess the damage and determine the time to initiate farm-wide control. Monitoring is also important to avoid calendar-based pesticide applications especially at lower pest populations that do not warrant treatments. b. Managing information: A good recordkeeping about pests, their damage, effective treatments, seasonal fluctuations, interactions with environmental factors, irrigation practices, plant nutrition, and all related information from year to year will build the institutional knowledge and prepares the grower to take preventive or curative actions. 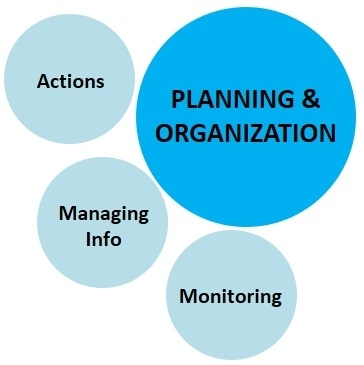 c. Corrective actions: Taking timely action is probably the most important aspect of IPM. Even with all the knowledge about the pest and availability of resources for its effective management, losses can be prevented only when corrective actions are taken at the right time. Good farm management will allow the grower to take timely actions. These actions are not only necessary to prevent damage on a particular farm, but also to prevent the spread to neighboring farms. When pest management is neglected, it leads to area-wide problems with larger regulatory, social, and economic implications. Good communication to transfer the individual or collective knowledge for the benefit of everyone is the last component of the new IPM model. Modern and traditional communication tools can be used for outreach as university and private researchers develop information about endemic and invasive pests, emerging threats, and new control strategies. a. Staying informed: Growers and pest control professionals should stay informed about existing and emerging pests and their management options. Science-based information can be obtained by attending extension meetings, webinars, or workshops, reading newsletter, trade, extension, or scientific journal articles, and keeping in touch with researchers and other professionals through various communication channels. Well-informed growers can be well prepared to address pest issues. 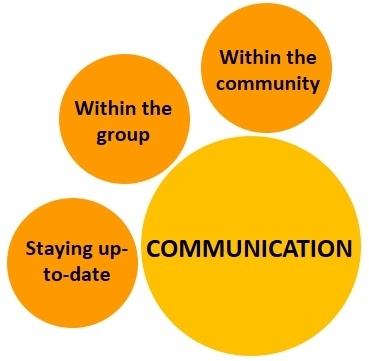 b. Communication within the group: Educating farm crew through periodical training or communication will help with all aspects of pest management, proper pesticide handling, ensuring worker safety, and preventing environmental contamination. Knowledgeable field crew will be beneficial for effective implementation of pest management strategies. c. Communication among growers: Although certain crop production and protection strategies are considered proprietary information, pests do not have boundaries and can spread to multiple fields when they are not effectively managed throughout the region. Sharing knowledge and resources with each other will improve pest control efficacy and benefit the entire grower community. In addition to these four components with an IPM model, factors that influence profitable, safe, and affordable food production at a larger scale and their implications for global food security should also be included. There are two layers surrounding these four components addressing the business and sustainable aspects of food production. Consumers want nutritious, healthy, and tasty produce that is free of pest damage at affordable prices. Growers try to meet this demand by producing food that meets all the consumer needs, while maintaining environmental and human safety and still being able to make a profit. Sellers evaluate the market demand and strategize their sales to satisfy consumers while making their own profit to stay in the business. In an ideal system, consumer, producer, and seller would maintain a harmonious balance of food production and sale. In such a system, food is safe and affordable to everyone, there will be food security all over the world, and both growers and sellers make a good profit with no or minimal risk to the environment in the process of food production. However, this balance is frequently disrupted due to i) consumers' misunderstanding of various food production systems, their demand for perfectly shaped fruits and vegetables at affordable prices or their willingness to pay a premium price for food items that are perceived to be safe, ii) growers trying to find economical ways of producing high quality food while facing with continuous pest problems and other challenges, and iii) sellers trying to market organic food at a higher price as a safer alternative to conventionally produced food. If growers implement good IPM strategies to produce safe food and consumers are aware of this practice and gain confidence in food produced in an IPM system, then sellers would be able to market what informed-consumers demand. As mentioned earlier, IPM is an approach to ensure economic viability at both consumer and producer level (seller is always expected to make a profit), environmental safety through a balanced use of all available pest control options, and social acceptability as food is safe and affordable. While organic food production is generally perceived as safe and sustainable, the following examples can explain why it is not necessarily true. Organic food production is not pesticide-free and some of the pesticides used in an organic system are as harmful to humans and non-target organisms as some chemical pesticides. Certain organically accepted pesticides have toxins or natural chemical molecules that are very similar to those in synthetic pesticides. In fact, some synthetic pesticides are manufactured imitating the pesticidal molecules of natural origin. Mechanical pest control practices such as vacuuming or tilling utilize fossil fuels and indirectly have a negative impact on the environment. For example, diesel-powered tractors are operated for vacuuming western tarnished bug in strawberry 2-3 times or more each week while a pesticide application typically requires the use of tractor once every 7-14 days. To control certain pests, multiple applications of organic pesticides might be necessary with associated costs and risks, while similar pest populations could be controlled by fewer chemical pesticide applications. It is very difficult to manage certain plant diseases and arthropod pests through non-chemical means and inadequate control not only leads to crop losses, but can result in their spread to larger areas making their control even more difficult. Many growers prefer a good IPM-based production to an organic production for the ease of operation and profitability. However, they continue to produce organic food to stay in business. While middle and upper-class consumers may be willing to pay higher prices for organically produced food, many of the low-income groups in developed and underdeveloped countries cannot afford such food. Organic food production can lead to social inequality and a false sense of wellbeing for those can afford. Food security for the growing world population is necessary through optimizing input costs, minimizing wastage, grower adoption of safe and sustainable practices, and consumer confidence in food produced through such practices. IPM addresses all the economic, environmental, and social aspects and provides safe and affordable food to the consumers and profits to producers and sellers, while maintaining environmental health.